Make Sure You Have Air Purifiers In Your House This Fall! Well, if you have been following us on Facebook, you would have seen that my family and I recently just completed a big move! We moved from Wisconsin where we have lived for four years back to Minnesota where we grew up and where our family and friends live. It has been exciting, scary, sad, stressful and so many other emotions mixed in! Currently, we are living with my husband's family until our house sells in WI. It is definitely harder to live in someone else's house and try to be comfortable (especially with most of our belongings in storage!) but we are doing the best we can! One of the items I knew we needed to have in each room in this house while we live here is air purifiers! They use so many different products and have different allergens than what we are used to and I could notice the affect it had on my children, my husband and I right away. The first thing we did in each room is set up our air purifiers! In our bedroom, we immediately set up our new Fellowes AP-300PH air purifier! It has really helped reduce the risk of illness and allergies for our family this fall! 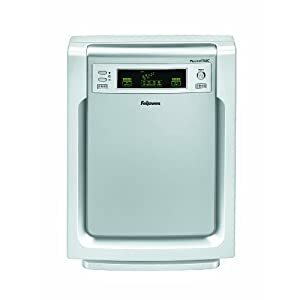 Plus, I trust it so much to keep away the allergens, toxins, and other bad stuff because it has a True HEPA Filter that safely removing 99.97% of pet dander, mold spores, pollen, dust mites, allergens, cigarette smoke and odors. We know it is working because it has a great Air Purity Sensor monitoring the air quality and automatically adjusting the fan speed to keep air purified. It also has an ultra quiet operation if that is what you are looking for or you can turn up the fan speed to create a little white noise in the room like we like! For more information, visit fellowes.com/airpurifiers. Buy It: Great News!! There are great deals this time of year on the AP-300PH on Amazon.com! Right now you can purchase it for $119.99 on Amazon.com when the normal retail value is $199.99.